So you get pulled over for suspected drunk driving and you wonder if you should refuse the breathalyzer test. 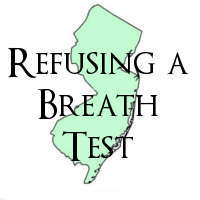 Just be aware that as long as you have a New Jersey driver’s license, through the state’s implied consent law, you’ve already agreed to submit to a breathalyzer test, known as the Alcotest machine. If you are arrested for DWI, the law requires that you expressly agree to submit to the breathalyzer test. This means that if you give the officer conditions in order to agree to the test or an ambiguous answer, like “I guess,” this is considered a refusal. Silence means no, too. And of course, if you actually say “NO” this is obviously viewed as a refusal as well. If you don’t consent, the law officer will charge you with Refusing to Submit. Keep in mind, you can still be charged with a DUI without the breathalyzer. So, a refusal probably means you are now facing two separate drunk driving-related charges. A conviction for Refusing to Submit will result in a license revocation for at least seven months, between $300 and $2,000 in fines and fees and 12 hours minimum participating in an Intoxicated Driver Resource Center program. These penalties are separate from any punishment you might receive from an associated DWI conviction. It’s tough, but you can beat a refusal charge. The law officer must show probable cause for both the vehicle stop and the request to have you take the breathalyzer test. If the state cannot prove probable cause, it must dismiss the Refusal charge. Keep in mind though, it’s easier and less costly to fight your DWI charge, than to fight that and your charge for Refusing. It’s always better to keep your charges to a minimum. And your guilt is not assured simply because your breath test reading is above the legal limit. An experienced DWI attorney can help fight your drunk driving charges. So, usually your best bet is to consent to the Alcotest. If you have been charged with DWI or Refusal, call the New Jersey DUI Lawyers, right away at 877-450-8301 to launch an effective defense. Our skilled DWI/DUI defense attorneys can mean the difference between a dismissal and a conviction. To learn more about how we may be able to help you or your loved one, contact our office today for a free consultation with an experienced defense attorney.